And the PhD student on a quest to find it. On the night of the Academy Awards ceremony in 1938, Oscar-nominee Alice Brady sat at home with a broken ankle. As the popular version of the story goes, she won Best Supporting Actress for her role in In Old Chicago, but because she was laid up at home, a mystery man accepted the award on her behalf. After that, he—and the award—were never seen again. It’s a tale that’s been told and re-told over decades as one of the most enduring mysteries in Oscar history in outlets like the Los Angeles Times, Fox News, and NPR. But, it turns out, everyone has been getting it very, very wrong. The book and the legend are the foundation of what one might call Rutigliano’s detective work. At just 25, Rutigliano has made untangling Oscar lore somewhat of a professional specialty, and although she’s officially an English literature and theatre PhD student at Columbia University, she’s also one of the country’s foremost experts on the award show’s history. Alice Brady’s Oscar was the first award ever “stolen,” 80 years ago this month. 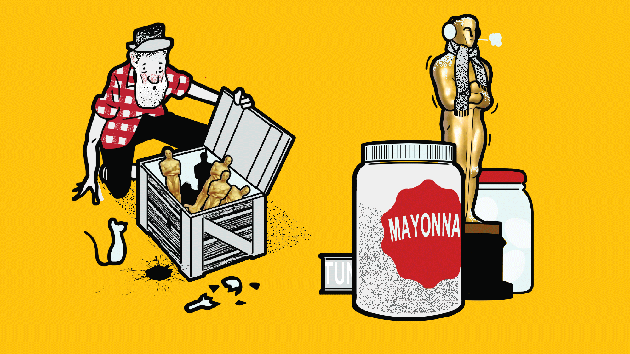 The lore surrounding missing or stolen Oscars runs deep and wide. There’s the case of the award won in 1940 by Hattie McDaniel, the first black woman to take home the award, for her role in Gone With the Wind; it was supposedly stolen by students from a display case at Howard University during race riots in the 1960s. There’s Vivien Leigh’s Oscar from A Streetcar Named Desire in 1951 which was famously stolen from her London home during a 1953 break in. (Thieves also nabbed some silverware and clothing valued to be less than $300 at the time.) And there’s a story in which in 1999, Michael Jackson bought a Gone With the Wind Best Picture Oscar for $1.5 million, but the award supposedly vanished after his death and was reported missing in 2016. And most recently, just last year, two of the Weinstein Company’s Oscars reportedly disappeared amid the ever-widening Harvey Weinstein scandal fallout. Rutigliano calculates that only 12 of those 79 are still missing. Over the years, many of them have turned up in some of the most unusual places, with little explanation. Perhaps the most absurd example is from 2000: A 61-year-old auto-parts repairman, Willie Fulgear, stumbled across 10 crates holding a whopping 52 Oscar statuettes while reportedly digging in the trash behind a Los Angeles laundromat. He contacted the police, and the Academy rewarded him with $50,000 and tickets to a ceremony. Later, three men—one of whom turned out to be relative of Fulgear—were charged with the heist, apparently having stolen the statuettes off a loading dock in suburban L.A. In another case, child-star Margaret O’Brien’s Oscar, which she won for 1945’s Meet Me in St. Louis, was allegedly taken by a housekeeper in 1954. Forty years later, two memorabilia collectors spotted the statuette at a flea market in Pasadena, bought it for $500, and returned it to O’Brien. And in 2002, Whoopi Goldberg’s Best Supporting Actress Oscar for Ghost went missing after she shipped it to the Academy for cleaning. It was later recovered by a security guard in an California airport trashcan. According to a member of Goldberg’s team, someone at the airport had intercepted the statuette during transit, and the Academy speculates that the alleged thief abandoned any plan to sell the award after seeing the serial number on its bottom. The Academy isn’t exactly forthcoming with information about what has happened to each of the 79 onetime-misplaced Oscars. In fact, it is quite tight-lipped about Oscar whereabouts (much of their archives aren’t open to the public), in effect creating a heightened air of mystery. And of course the mystery has inspired academics like Rutigliano, as well as others. A group of researchers led by W. Burlette Carter at The George Washington University, for example, spent a year investigating the case of Hattie McDaniel’s stolen Oscar from Howard University. It released a 67-page report on the case in 2011, which theorizes that “the Oscar was not stolen by irate students, upset that Howard would honor McDaniel, but rather was returned to Howard’s Channing Pollack Theater Collection, most likely between the spring of 1971 and the summer of 1972.” The Oscar is still missing. Michael Jackson bought a Gone With the Wind Best Picture Oscar for $1.5 million, but the award supposedly vanished after his death. At the University of Pennsylvania, she actually received a research grant to study stolen Oscar lore, including Brady’s missing award. “Olivia, she got the idea, and I just sort of let go of the reins and let her go for it,” Timothy Corrigan, a professor of English and cinema studies at Penn and an advisor on the project, tells Mother Jones. Rutigliano decided to go straight to the source, emailing the Academy. Within a week, an Academy librarian, Libby Wertin, wrote back with devastating news: The mystery was already solved—for about a decade, no less, the details had just never been publicly disclosed. The real story began like this: The 10th Academy Awards ceremony was a wreck before the event even started. Originally scheduled for March 3, the ceremony was pushed back a week after a flood stranded Academy president Frank Capra at home, swept Warner Brothers’ rubber whale, a film prop, into the Los Angeles River, and injured several Hollywood stars. As Rutigliano discovered, 1938 newspaper clippings collected by Academy librarians show that Brady had indeed been bedridden on the night of March 10, but the “mystery man” who accepted her award was actually In Old Chicago director, Henry King. Further reports reveal that after a night of partying, colleagues delivered the award to Brady, with instructions to bring it back to the Academy for engraving. (At the time, Oscars were engraved after the ceremony, unlike at today’s awards.) There is actually a picture of Brady with actor Charles Winninger receiving the award post-engraving. So it’s been confirmed she got the award. But in October of the next year, Brady died of cancer at age 46. That’s where the paper trail seemed to stop. What, Rutigliano wanted to know, happened to it then? Wertin admitted to her that no one knew the current location of the award. What’s more, Rutigliano wanted to know, how did the legend get started in the first place? Rutigliano let the case lie for years after that. It wasn’t until her days as a PhD student, after an advisor at Columbia encouraged her to write about her Oscar research for the online academic journal Politics/Letters and Vanity Fair, that Rutigliano re-opened the investigation. “Even if Alice Brady’s award hadn’t gone missing, there is still an elaborate myth about what actually did take place.” It was then that she was able to trace the false account of Brady’s “mystery man” as far back as the 1986, to an Oscar anthology titled, Inside Oscar, but both of the authors failed to provide a citation for their information and had since died. As for the current owner of Brady’s Oscar, Rutigliano discovered that an auction house, Heritage Auctions, in Dallas, Texas, had sold what was labeled as a “replacement award” for Brady in 2008. But Rutigliano knew from her past research that there actually was no replacement award issued. Rutigliano tried to contact the buyer to tell them the award was actually an original, but they had purchased it anonymously. She now worries the owner will never know the truth about Brady’s award. “My plan is to keep talking about Alice Brady’s not-stolen Oscar and hope that the message gets to them,” she says. In addition to her work on the Brady case, Rutigliano has logged the details of each of the 79 once-missing Oscars—including those belonging to celebrities like Bing Crosby, Lewis Milestone, and Katharine Hepburn. The details of McDaniel’s and Leigh’s missing Oscars are still a mystery, though—and thus remain on Rutigliano’s radar. And when it comes to guessing winners at the Academy Awards, Rutigliano claims to be “so bad” at Oscar predications. Knowing its entire past, she says, hasn’t been any help. Still, for what it’s worth, on Sunday she wants Lady Bird or Get Out to win Best Picture. Here’s to hoping—or not—that the winning cast holds onto their statues.